Mrs. Lovett’s Best Love Meat Pie Recipes was first published in London in 1848 by the House of Sweeney Todd. The book caused an instant stir when it hit the book stands, because it solved the Victorian era problem of the poor and undernourished by doing away with the poor and undernourished. By putting them to good use, Mrs. Lovett’s recipes cut the welfare rolls and did away with debtors prisons once and for all. While many of you are in the know, Sweeney Todd was a musical about a murderer in London in the 1800’s that disposed of his bodies by giving them to Mrs. Lovett who turned them into food. In one of our Gourmet Club dinners (the one with a theme of English food), one couple brought their version. They were delicious, even if they used non-human meat! Let the puff pastry stand at room temperature an hour ahead.  Sautee garlic, onion, and celery root shallots in the butter until the celery root is tender.  Add the shallots and continue cooking until they are translucent.  Stir in the beef tenderloin and a sprig of thyme, cook until the beef is done.  Add enough brown sauce to thicken the liquid in the mixture and provide enough moisture for the meat and vegetables to stay moist in the pie.  Season with salt and pepper to taste.  Remove the thyme sprig.  Flour the work surface and the rolling pin.  Roll out each sheet of the puff pastry, large enough to stamp out 12 circles.  Beat the egg and use it for an egg wash, spreading on the surface of the stamped puff pastry.  Scoop ~ 2 tea spoonful’s of the beef mixture into the center of the egg washed side of thepastry. 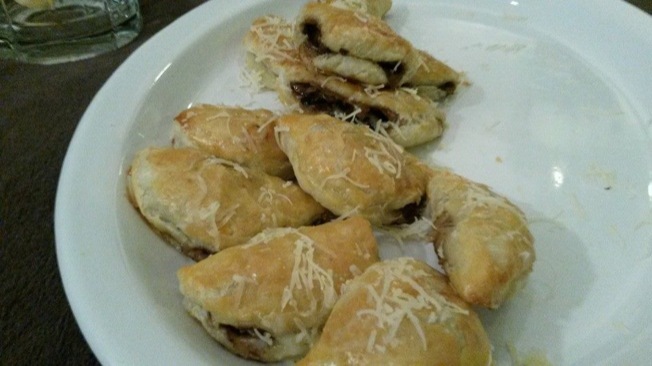  Fold the pastry in half and press the meeting edges together so the filling is enclosed.  Place in rows on a parchment paper covered cooking sheet.  Egg wash the exposed side of the pastries.  Cook at 400 degrees Fahrenheit until the surface is golden brown.  Sprinkle a light layer of the finely shredded gruyere over the pastries.  Let stand until cool enough to eat and enjoy.Makes 48 or so of these tasty starters. Nicely done. Good idea. Little meat pie pockets! I will make this version very soon.